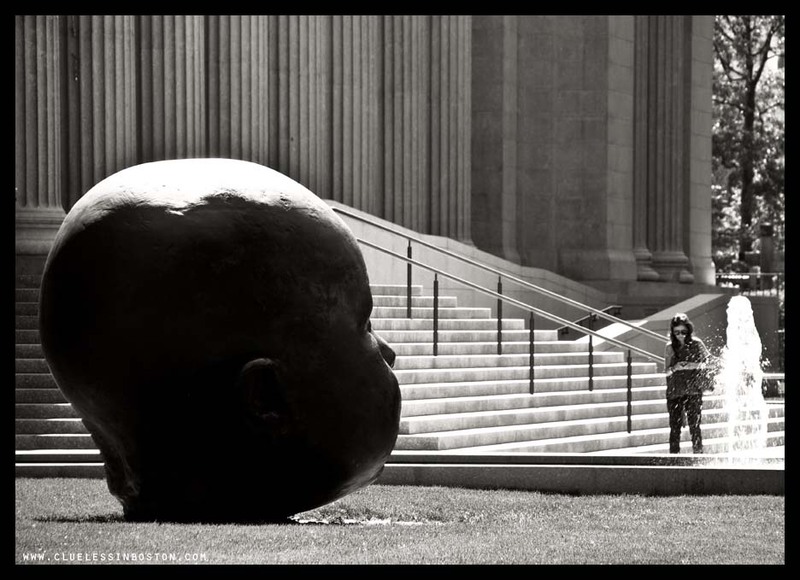 At the Fenway entrance to the Museum of Fine Arts, Giant Baby Head and girl texting. The sculpture is by Spanish sculptor Antonio López García. The baby's twin rests at the other end of the museum entrance. That is a great capture. I wonder if she's feeling stared at, ha ha. I love the big giant head! Well spotted; the water column in the fountain almost has a surreal human shape as well. I still think it strange! Like these two together though. Something would be missing without the girl. With the girl it is a very interesting photo because of the contrast joo has mentioned already and the weirdness (is there no noun to "bizarre" I wonder ... ) b squared is seeing. That big baby head is spooky!